Not to be confused with diesel-electric locomotive. An electro-diesel locomotive (also referred to as a dual-mode or bi-mode locomotive) is powered either from an electricity supply (like an electric locomotive) or by using the onboard diesel engine (like a diesel-electric locomotive). For the most part, these locomotives are built to serve regional, niche markets with a very specific purpose. Electro-diesel locomotives are used to provide continuous journeys along routes that are only partly electrified without a change of locomotive, avoid extensive running of diesel under the wires (using a diesel locomotive where electrified lines are available), and giving solution where diesel engines are banned. They may be designed or adapted mainly for electric use, mainly for diesel use or to work well as either electric or diesel. Note that, as well of electric multiple unit (EMU) and diesel multiple unit (DMU), where no any kind of locomotive is present, even electro-diesel multiple unit (BMU) exist. British Rail Class 73, no. E6013 (73107) at Rowsley South, on the Peak Railway on 17 April 2003. This locomotive was on loan from Fragonset Railways, and has since returned to main-line service with RT Rail. This is effectively an electric locomotive with a relatively small auxiliary diesel prime mover intended only for low-speed or short-distance operation (e.g. British Rail Class 73). Some of these, such as the British Rail Class 74, were converted from electric locomotives. The Southern Region of British Railways used these locomotives to cross non-electrified gaps and to haul boat trains that used tramways at the ports of Southampton and Weymouth. For economy, the diesel engine and its generator are considerably smaller than the electric capacity. The Southern types were of 1,600 hp or 'Type 3' rating as electrics, but only 600 hp as diesels. Later classes had as much as 2,500 hp on electric power, but still the same diesel engines. Despite this large difference, their comparable tractive efforts were much closer (around three-quarters as diesels) and so they could start and work equally heavy trains as diesels, but not to the same speeds. This is effectively a diesel locomotive with auxiliary electric motors (or connections to the existing traction motors), usually operating from 750 V DC third rail where non-electric traction is banned (e.g. EMD FL9, GE Genesis P32AC-DM, EMD DM30AC). The primary function for these models is to provide a "one-seat ride" (a rail trip that doesn't require a transfer to a different train) between the electrified and non-electrified sections of a rail system or to allow trains to run through tunnels or other segments of track where diesel locomotives are generally prohibited due to their production of exhaust; such locomotives are used for certain trains servicing the New York City terminals of Grand Central Terminal and Penn Station, as the various rail tunnels into Manhattan have exhaust restrictions. Once out of the tunnels, the engines are started and operation is as a normal diesel locomotive. With modern electronics, it is much easier to construct (or adapt) an electro-diesel locomotive or multiple-unit which is equally at home running at high speeds both "under the wires" and under diesel power (e.g. SNCF Class B 82500, Bombardier ALP-45DP). These will normally operate under pure electric traction where possible, and use the diesel engines to extend the journeys along non-electrified sections which would not be cost effective to electrify. They may also be used on long cross-country routes to take advantage of shorter sections of electrified main lines. Gmeinder class 478.6 diesel and 750 V DC third-rail (bottom contact). Voith Futura, a 2009 CREAM Project concept locomotive rebuilt from DB 240 002. Bombardier TRAXX "Last Mile Diesel", mainly electric. Orders signed 2010, to be delivered probably 2012. Pesa 111Ed Gama Marathon – mainly electric, with auxiliary diesel engine enabling last-mile operation on non-electrified tracks. Gama Marathon was first presented in 2012 at InnoTrans Berlin. The locomotive then underwent a series of tests with rail operators Lotos Kolej (in goods traffic) and PKP Intercity (in passenger traffic), after successful conclusion it was offered on the market. In July 2015 the Polish train-operating company Locomotiv bought the prototype and signed order for further two Marathons. Newag Dragon – version of this electric freight locomotive for the Freightliner's Polish branch, Freightliner PL Sp. z o.o. (five units delivered in 2016) is equipped with auxiliary diesel engine. Newag Griffin – a version of this electric freight locomotive, leased to Lotos Kolej in 2017 for 7 years with a provision to extend the lease, is equipped with auxiliary diesel engine. FEVE 1.900 Series, 1500 V DC overhead wires. This series is a rebuild of FEVE 1.000 Series locomotive. CAF Bitrac 3600, 3000 V DC overhead wires. October 2007 order for nine freight Co-Co locomotives. Available in Bo-Bo and Co-Co wheel configuration, 1,435 or 1,668 mm (56.5 or 65.7 in) gauge, and as freight or passenger versions of 120 and 180 km/h (75 and 112 mph) maximum speeds respectively. Locomotives for RENFE Class 130, by Talgo. Locomotives for RENFE Class 730, by Talgo. Swiss Federal Railways Tem I 251–275 (1950–57), Tem II 276–298 (1967) and Tem III 321–365 (1954–62) shunters (Tem III see image) of which only few are still in service. Swiss Federal Railways Eem 923 shunters using both 15 kV 16.7 Hz and 25 kV 50 Hz overhead wires and a 360 kW auxiliary diesel engine are on delivery from Stadler Rail's Winterthur plant. An experimental electro-diesel locomotive, DEL120, was built by London Underground in 1940 but was not a success. Two types have been built whose electricity source was a 750 V DC third rail. British Rail Class 73, dating from 1962 – the more successful design, with some still in regular use. They originally had lower power output in the diesel mode, but are being re-engined to provide more power (2014, 50 years since introduction). British Rail Class 74 – rebuilt from British Rail Class 71 electric locomotives in 1967 and withdrawn by 1977. British Rail Class 88 – locomotive used by Direct Rail Services. Introduced in 2017. Warnings: the sections below are WORK IN PROGRESS, result of moving to "Electro-diesel multiple unit" the informations about Electro-diesel Multiple Unit, here incorrectly reported; please give help on this transfer. Bombardier ALP-45DP – 20 locomotives ordered for the Mascouche line (AMT). It is a joint order with the New Jersey Transit order. They provide a through journey on this mostly un-electrified new line, which joins an existing electrified commuter line to access Montreal's Central Station through the poorly ventilated, 25 kV AC electric only Mount Royal Tunnel. P32AC-DM – dual-mode version of the GE Genesis, primarily diesel, electric mode is only used for a few miles of travel. EMD DM30AC – specific to the Long Island Rail Road, primary diesel, the electric mode is only used for service to Penn Station. Bombardier ALP-45DP – 35 locomotives were purchased by NJ Transit, to bridge gaps between non-electrified and electrified sections of track into New York Penn Station. These trains have been used to provide a "one-seat ride" to New York Penn Station both for commuters using non-electrified portions of the system. 17 more are on order. Baldwin RP-210 – primarily diesel-hydraulic, third-rail electric mode for short-term use only. "Roger Williams" streamlined, six car, lightweight, DMU passenger train, built by the Budd Company in 1956 for the New York, New Haven and Hartford Railroad – primarily diesel-hydraulic, third-rail electric mode for short-term use only. 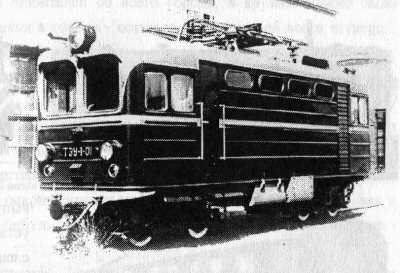 Fairbanks Morse P-12-42 – primarily diesel-electric, third-rail electric mode for short-term use only. EMD FL9 – primarily diesel-electric, third-rail electric mode for short-term use only. GE three-power boxcab - tri-mode switcher locomotive model built in 1930, was also capable of operating as a battery locomotive, All retired and scrapped. GE/Garrett Gas Turbine MUs - primarily electric, but built with Gas Turbines to allow operation outside of third rail electrification. All scrapped. The South African Class 38-000 is a 3 kV DC electro-diesel locomotive designed by Consortium under the leadership of Siemens and built by Union Carriage and Wagon (UCW) in Nigel, Gauteng, South Africa. Between November 1992 and 1993 fifty of these locomotives were placed in service by Spoornet, formerly the South African Railways (SAR) and later renamed Transnet Freight Rail (TFR). The diesel engine enables the locomotive to shunt on unelectrified sidings. A specialized type of electro-diesel locomotive is the hybrid locomotive. Here, the electricity comes from a battery charged by the diesel engine rather than from an external supply. An example is the Green Goat switcher GG20B by Railpower Technologies, a subsidiary of R.J. Corman Railroad Group since 2009. ^ Allen, G. Freeman (1962). British Railways Today and Tomorrow (3rd ed.). Ian Allan. pp. 88–89. ^ cream-project.eu "Customer-driven Rail-freight services on a European mega-corridor based on Advanced business and operating Models"
^ "Railway Herald :: Imaging Centre :: 240002 at Kiel Voith Turbo Lokomotivtechnik"
^ "Bombardier launches Traxx electro-diesel". Railway Gazette International. 10 May 2011. Archived from the original on 12 May 2011. Retrieved 11 May 2011. ^ "GAMA On Test". Railvolution. 5 December 2012. Retrieved 20 January 2013. ^ "GAMA Marathon Passenger Debut". Railvolution. 2 March 2013. Retrieved 12 March 2013. ^ "Maraton – a step closer to the perfect locomotive". PESA Bydgoszcz SA. Archived from the original on 6 January 2014. Retrieved 20 January 2013. ^ "Lokomotiv kupił Gamę i chce jeszcze dwie [Zdjęcia] (Locomotiv bought Gama and wants two more [photos])". Rynek Kolejowy (in Polish). 8 July 2015. Archived from the original on 11 July 2015. Retrieved 10 July 2015. ^ Madrjas, Jakub (2 February 2015). "Freightliner PL zamówił nowe Dragony z Newagu (Freightliner PL ordered new Dragons from Newag)". Rynek Kolejowy (in Polish). Retrieved 5 March 2016. ^ Szymajda, Michał (22 May 2017). "Pierwszy Griffin dla Lotos Kolej już gotowy [zdjęcia] (First Griffin for Lotos Kolej is completed [photos]". Rynek Kolejowy (in Polish). Retrieved 22 May 2017. ^ "Customer for CAF's Bitrac electro-diesel locomotive". Railway Gazette International. January 2008. ^ "Electro-diesel loco offers flexible traction". Railway Gazette International. 2008-01-03. Retrieved 2010-12-02. ^ "Electro-diesel shunter order". Railway Gazette International. 2010-07-08. Retrieved 2010-12-02. ^ (in Russian) https://цжд.рф/%D1%8D%D0%B4-16 "Электротепловоз ЭД-16"
^ (in Russian) http://www.scaletrainsclub.com/board/viewtopic.php?style=7&t=7707 "электро-тепловоз ЭД-18"
^ (in Russian) https://цжд.рф/%D0%BD%D0%BF1 "Тяговый агрегат НП1"
^ a b c "Bombardier to supply electro-diesel locos". Railway Gazette International. 2008-08-19. Retrieved 2010-12-02. ^ "MITRAC Hybrid The Dual Power Propulsion Chain" (PDF). Bombardier. ^ "NJ Transit approves FY2011 spending". Railway Gazette International. 2010-07-19. Retrieved 2010-12-02. ^ "NJ Transit to expand one-seat ride on North Jersey Coast Line". New Jersey Transit. 4 May 2014. Retrieved 1 June 2015. ^ Class 38 electro-diesel in operation, Railways Africa. ^ Railpower locomotive production line. "Pictures of the Russian OPE-1 locomotives". "Pictures of the Russian electro-diesels".